My work has obsessively questioned uprootedness, roots, contemporary migrations, belonging, hybridity, movement and the effects of war. World maps are metaphors for my more than 30 years of an „in transit“ state, between several languages and roots. 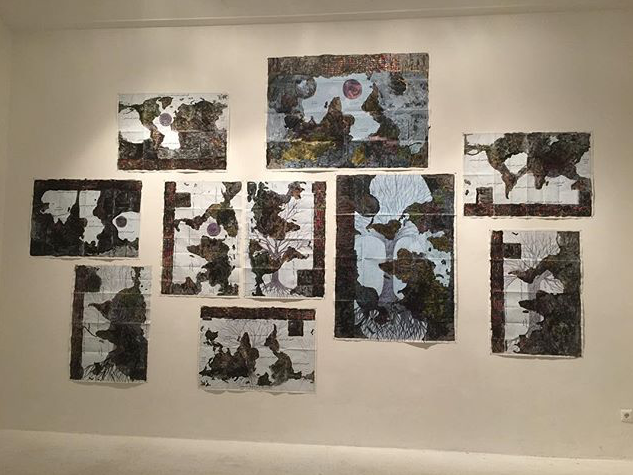 I use Iranian world maps which I de-politicize, deconstruct and reconstruct; making new geographies. My concern has been to use real world maps and to underline manmade disasters such as wars, pollution and corruption. Ghazel was born in 1966 in Tehran, Iran. She lives and works in Paris and Tehran. With the friendly support from the French Embassy in Tehran / Iran.